The Weekly Weather: As mentioned before, the weather was rather dreary this past week. This week is supposed to be much better, with more sun and warmer temperatures. I bet that pretty soon I will be complaining about the heat and humidity, but right now, it feels pretty good. What Paul’s Been Up To: He did quite a bit of work in the yard (mowing, fertilizing, weeding, etc.) and it shows! The grass is greening up and looks really nice. 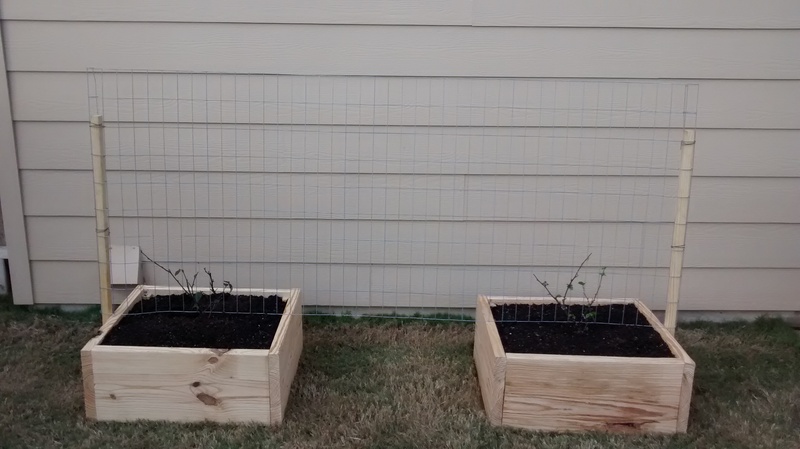 He also built some raised garden beds and planted some blackberries. You can read more about the process on his blog, here. Oh, and he planted the pumpkin seedling which had quickly exceeded its original home in a plastic cup. When he’s not doing yard work or working, he’s spending quite a bit of time working on his classes with the Pathway program. For one of his classes (a religion one), he has to keep a running journal about his reading. His journals are usually formatted like this. What Sarah’s Been Up To: Not too much, actually…still teaching piano (I had one student decide not to take lessons anymore, but another who is showing interest in starting, so it will work out), still leading the ward choir (we performed our Easter music today and received many compliments), still doing the visiting teaching coordination (almost all my slips are passed out…I may just mail the last two), and still maintaining the household (everything’s relatively clean, hahaha). 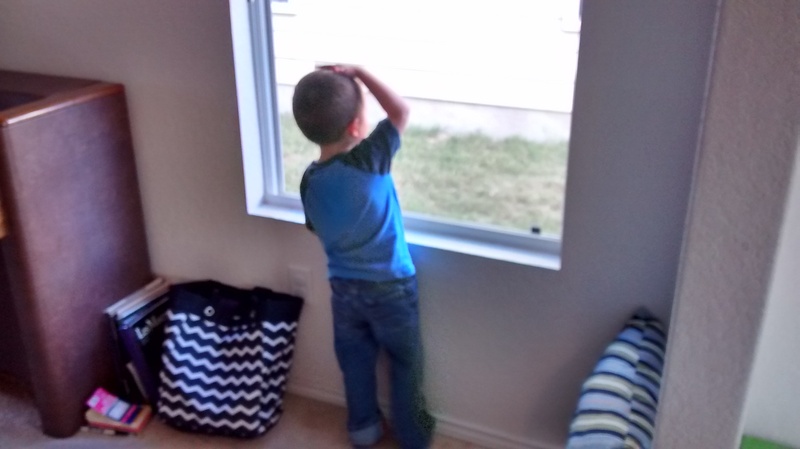 What Joseph’s Been Up To: Last Sunday (while I was typing up my blog, actually), he and his little buddy next door (a little boy about 6 months older than he is) were communicating to each other through the windows in our respective living rooms (since they line up perfectly). 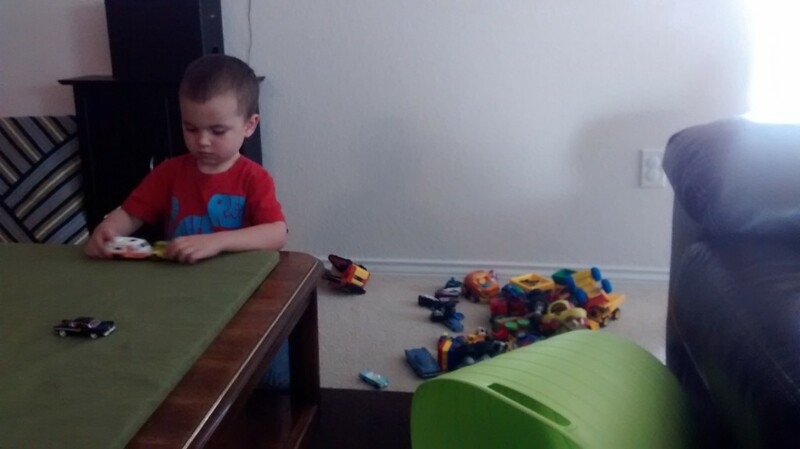 They told each other jokes, showed each other toys, and did a myriad of other things. It was pretty cute. 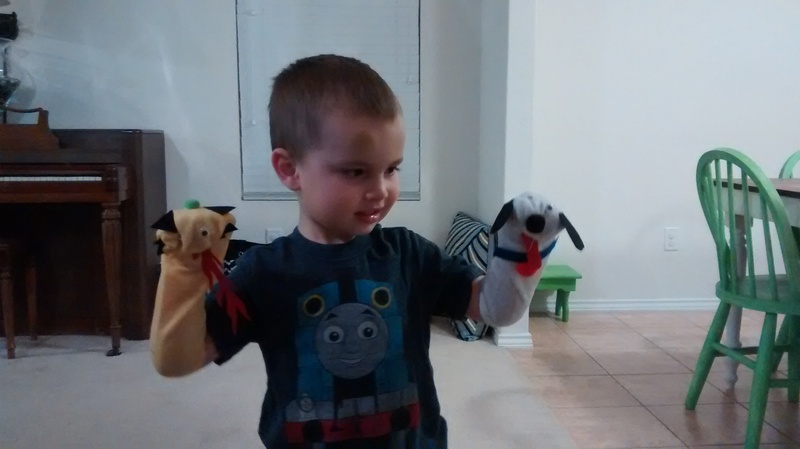 We also spent some time this week making sock puppets (his friend had some extra supplies left over, so his parents decided to share with us), which Joseph loves. 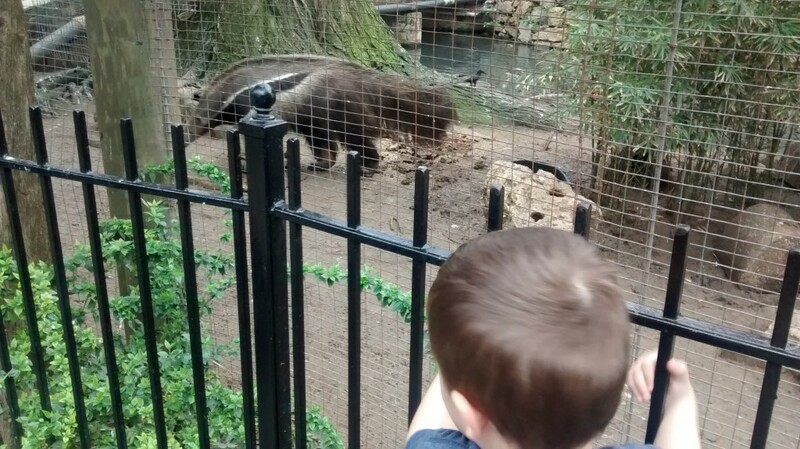 He loved the zoo, and was happy to go to the mall (since it meant he could play in the Lego Store). I did end up purchasing a mini kit for him to get to put together with Paul…who am I kidding? Paul put it together with Joseph’s help (since the instructions are still a bit over Joseph’s head). The past few nights, he’s been complaining about the dark at night, saying that there are monsters. I know this is a natural part of childhood, but man, it’s frustrating. I just keep reassuring him that everything is okay and that there is no such thing as monsters. 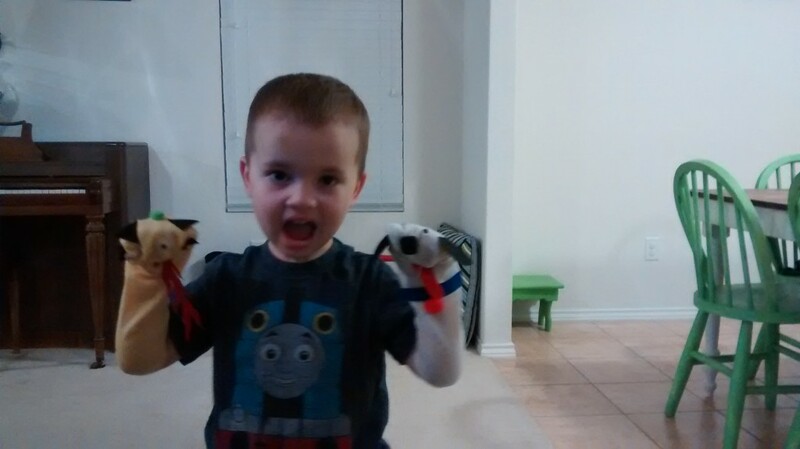 The other night, he asked specifically to have his plush armadillo, spider, and Angry Bird in bed so that they could protect him. I found his choice kind of amusing. 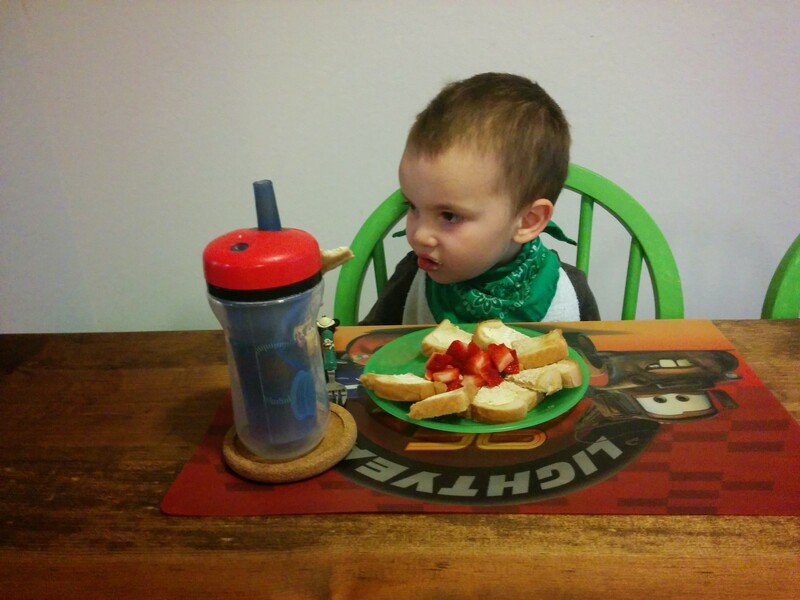 Making faces at his friend. Not much beats a pile of cars. 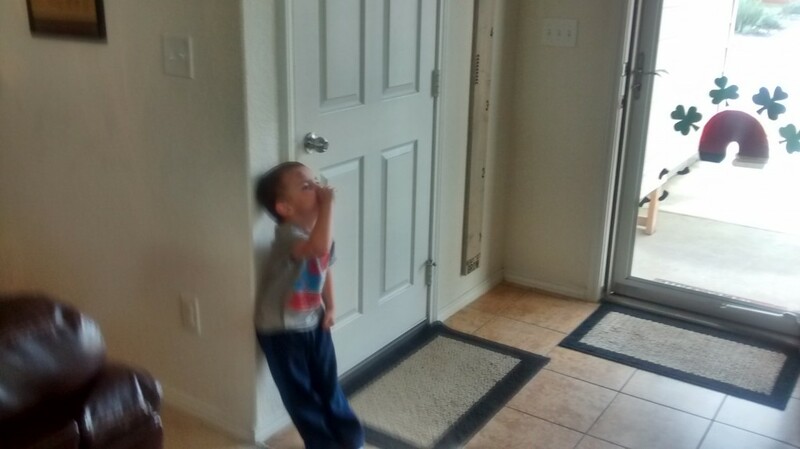 Announcing Paul’s arrival home by “playing” the trumpet. Sometimes I get creative with breakfast: a toast flower with strawberry center. 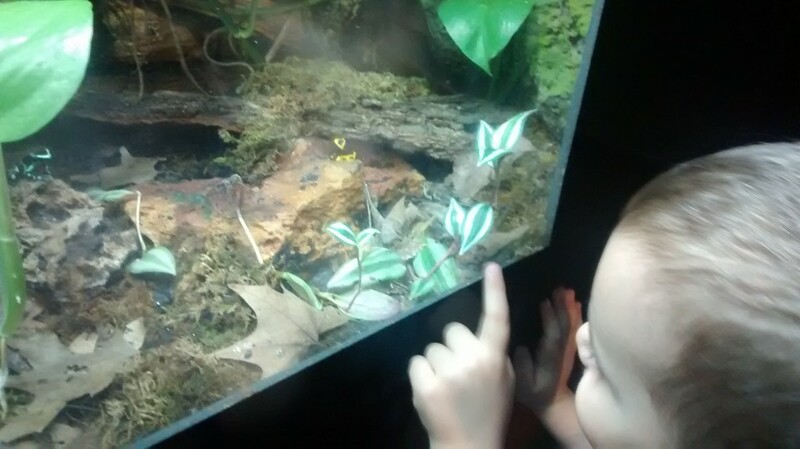 Pointing out the dart frogs. He loved their bright colors. 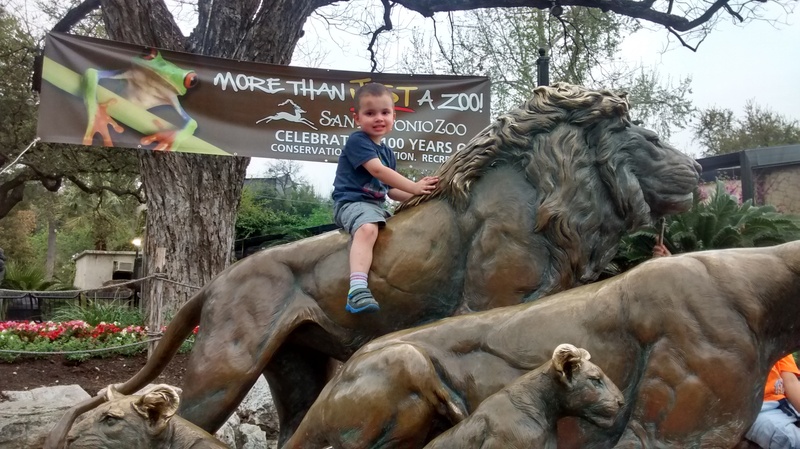 He always wants to sit on the “Daddy lion”. 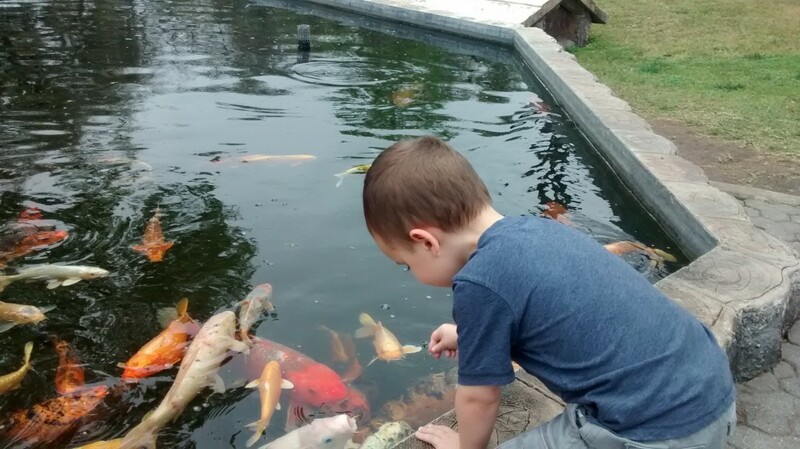 Feeding the fish…definitely a favorite. 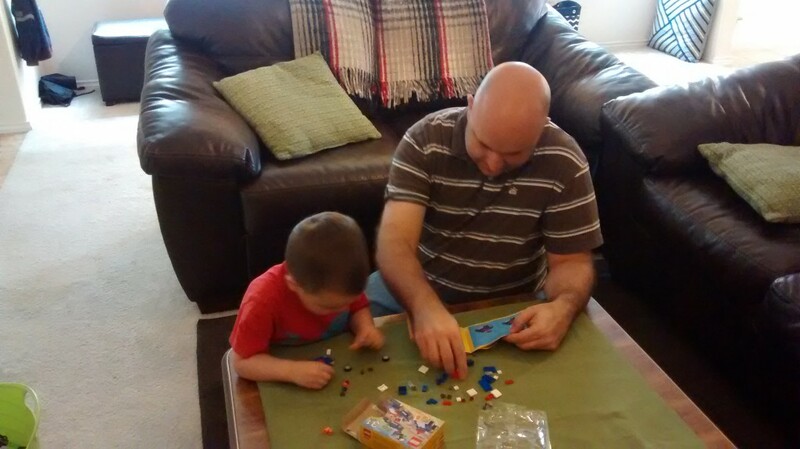 Building a Lego car with Daddy.